Located on Liberty Bay in Kitsap County, Poulsbo is not only renowned for its stunning waterfront views, but for its Scandinavian feel, thanks to the thousands of Norwegian immigrants that arrived in the late 19 th -century. Often referred to as “Little Norway on the Fjord,” Poulsbo waterfront real estate owners not only enjoy similar breathtakingly scenic views, but a historic, pedestrian-friendly downtown that’s home to a famous Scandinavian bakery, a host of museums, boutiques, antique shops, galleries and a number of waterfront eateries where guests can enjoy dining with beautiful marina and bay views. For at least 5,000 years, the Squamish people occupied villages here, fishing in the bays and streams, and harvesting shellfish along the marine shoreline. 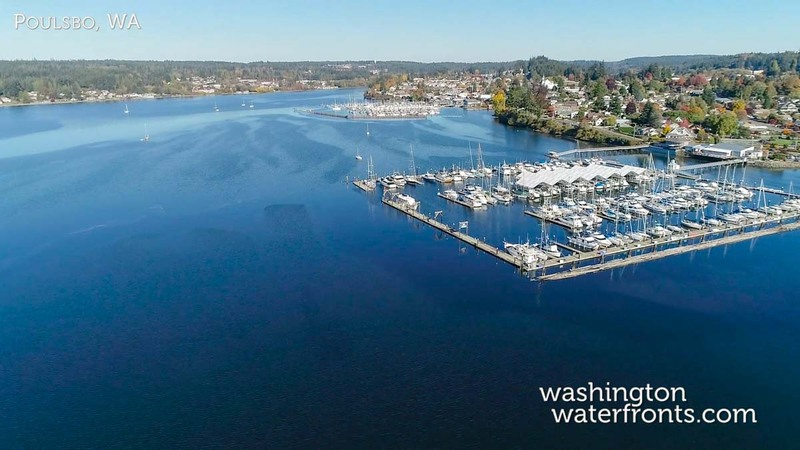 Today, Poulsbo waterfront property owners can look forward to doing the same, as well as taking part in a wide range of activities on the water and on land, from hiking, bird watching and golfing to kayaking, paddle boarding, jet skiing, fishing and sailing. No matter what your idea of the ideal Poulsbo waterfront real estate, you’re sure to find the perfect property. Choose a waterfront home downtown along Liberty Bay, or one that offers incredible water views at the mouth of the Hood Canal. From astonishing affordable homes on the canal leading out to Miller Bay where you can bask in the serenity of nature and enjoy water sports right out our backdoor to luxury waterfront homes where you can watch the boat traffic along the canal and take in dramatic Olympic Mountain views, Poulsbo waterfront real estate offers it all, and at some of the best values around. Poulsbo waterfront properties will put you right in the heart of the best that the Pacific Northwest has to offer, including the chance to enjoy much of it right from home. All of that, and you’ll be just minutes away from the Bainbridge Island ferry to Seattle where you’ll find a wealth of world- renowned attractions. Take advantage of our industry-leading tools to make your property search as easy as possible and be sure to register for a FREE account so that you can receive email alerts whenever new Poulsbo waterfront real estate for sale hits the market. If you're seeking to sell your Poulsbo waterfront property, contact our Waterfront Specialists directly for a comprehensive listing analysis and to learn more about the cutting-edge marketing strategies we'll use to sell your home quickly for top dollar!